Server-less event driven data-pipeline based Advanced Analytics Portal. Winning is the leading element in Sports, and it requires right decisions taken at the right time. Sports Analytics provide a competitive advantage to teams or individual players by generating actionable insights into a collection of historical statistical data. BDB delivers Sports predictions by exploring data via advanced analytical methods revealing decisive sports insights. Data Analytics has a considerable role to play in Cricket since the game of Cricket generates massive data per match. So, a Data Analyst can play with that data and come up with many insights. Crictix is our unique analytics model to enhance the state of sports analytics. Crictix applies advanced methods from Statistics, Applied Mathematics, Computer Science, Machine Learning to bring forth accurate, profound, and logical visual outcomes for the most unpredictable moves in Cricket. 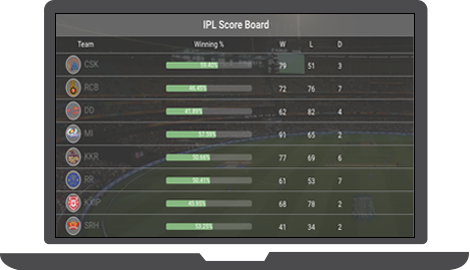 Crictix enables the prediction of match outcome, by interpretation of team and player performance. 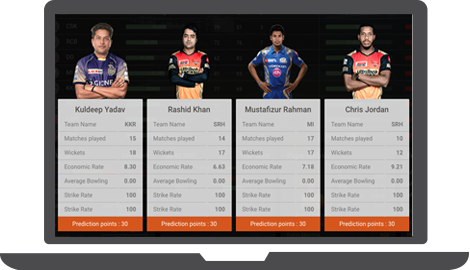 It anticipates what is likely to happen next, based on the study of the past to understand IPL cricket tournament in greater detail than ever before. The sporting achievement will always rely on the resolute human spirit to push higher, faster, and stronger. Player predictions help players to improve overall game performance in different situations. It identifies strengths and weaknesses of each player based on the detailed analysis of their game history. Past performances, Venue related details, current form, the effectiveness of live performance and their biometric data all together add to their predicted persona. It also helps one decide on the right player for team and game. Sometimes predictions are also made about the players’ injury so that substitute can be planned to defend the overall team performance. Cricket is a team game; winning factor moves along with the determination of a team. Crictix with data-driven analytical techniques helps teams build a strategy that can bridge the slip between the cup and the lip. Teams can analyze the opposition team’s strengths and weaknesses through rigorous analysis of their scoring patterns at the vulnerable moments during the previous innings. Here, addition and elimination of a player also play a vital role. 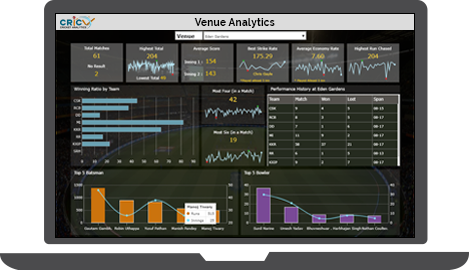 Power of data and the right analytical application can lift outcomes in the Cricket Stadium. The systematic study of field history plays a significant role to enhance the overall effect of a game. It can also help draw a comparative study of two teams or to key players of the opponent teams based on their previous record at the given place. Identifying parameters like Highest Score, Average Score, Economy Rate, Winning Ratio by Team, Team Performance, History of the place can bring more profound insights concerning the team or individual player in the Sports Analytics. Why BDB for Sports Analytics ?